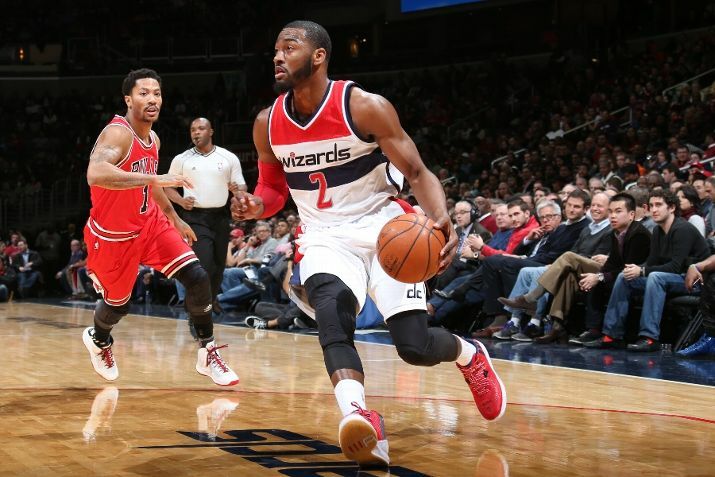 The Wizards take care of the Bulls in a “must win” game to prove their legitimacy in a 102-86 win. Marcin Gortat led the way in scoring for the Wizards with 21 points but it was John Wall who had 16 points and 12 assists in his first ever head to head win against Derrick Rose. The Wiz started the game hot from the floor while the Bulls started a cool 1-8. This paved the way for the rest of the game as the Wizards never relinquished the lead. Two early threes from Paul Pierce and some very aggressive play from the bigs’ Nene and Gortat guided the Wizards hot start. On the other side, Derrick Rose was the only offensive threat for the Bulls in the first quarter taking their first three shots and seven in the quarter. The Wizards used the combination of great defense and poor shooting from the Bulls to enjoy a 30-13 lead at the end of the first. With the reserves in from both sides to start the second quarter, the Bulls played with much more urgency whereas the Wizards came out lackadaisical evidenced by four early turnovers. Aaron Brooks used his speed to feast on Andre Miller. Andre had no chance trying to stay in front of one of the fastest guards in the league. The Wizards switched Rasual Butler onto Brooks to help Miller out which it did, but Brooks was simply too fast for either of the guards. With the starters back in the game, Bradley Beal hit a corner three which was then followed up by a Nene dunk in transition to stretch the lead back out to 12. The Wizards ended the quarter on a 18-8 run to stretch the lead to 60-42 at half. The third quarter had a very similar feel to the first as the Wizards tried to get their bigs involved right away from the beginning. It’s known that Pau Gasol and Joakim Noah aren’t the most physical players so Nene and Gortat went right at them. Gortat had a very nice quarter which included some nice jump shots, layups on rolls to the hole, and offensive rebounds. Once again, Rose was the Bulls only real offensive threat in the third quarter and was the only Bulls player attacking the hole might I add. The 4th quarter started out very sloppily as neither team scored until the 10 minute mark. Aaron Brooks hit back to back threes to cut the lead to 8; their closest deficit since the first quarter. Back to back shots from Rasual Butler including a three pointer from the right corner stretched the Wizards lead back out to 13. The Bulls would not go away though. A combination of turnovers and missed shots by the Wiz kept the Bulls alive. With the Wizards lead at 12 and under two minutes to play, John Wall found Bradley Beal in transition to knock down a 3 and increase the Wizards lead to 15. It was the “DAGGER” that ended this one. Joakim Noah let out his frustrations out on the ball by kicking it into the support after a turnover. John Wall shot the technical free throw with “MVP MVP MVP” chants in the background. This was a great statement win but a tougher test presents itself on Sunday when the Wizards go to Atlanta to take on the Hawks.